Ajax Adventure Camp is an Aspen, Colorado summer camp offering fun outdoor adventures, including whitewater rafting, backpacking, horseback riding, and camping. They accommodate flexible schedules with day, week, and multi-week signups and punch passes. Ajax Adventure Camp is perfect for families visiting Aspen Snowmass! The Aspen Center for Environmental Studies (ACES) has four locations situated in the Roaring Fork and Frying Pan Valleys dedicated to promoting an awareness of our relationship to the environment. They offer community garden space at their Hallam Lake and Rock Bottom Ranch locations during the summer. And during the winter, their winter naturalists provide a window into mountain ecology by guiding visitors on snowshoe tours on Snowmass Mountain, Aspen Mountain, and at Ashcroft. ACES also offers school programs to cultivate an understanding and love for the natural world in the younger set. Also, they invite guest speakers to give informative and educational talks, known as Naturalist Nights, on topics ranging from hydrology, forest health, birds, land ethics, and beavers. The Aspen area has a lot to offer, and so does ACES in terms of interpreting and connecting with all the natural splendor of this spectacular place. The Aspen Club & Spa offers the largest health club in Aspen along with daily classes, a mind/body studio, indoor lap pool, tennis and racquetball courts, and a boxing room. The Aspen Club & Spa also offers spa services such as massages, facials, and a full salon. The Aspen Club Sports Medicine Institute is home to physical therapy and an Aspen chiropractor. The Aspen Club & Spa offers memberships along with day passes. Aspen Film has been in existence since 1979 with the goal to contribute rich, intriguing film programming to the Aspen community. Each year, Aspen Film hosts three noteworthy festivals: the Shortsfest, the Filmfest, and the Academy Screenings. These festivals feature over 200 brilliant films, each of which are truly a treasure to be on view in such a rural area. Aspen Guide Service offers guided fly fishing trips, from float trips to wade trips, on rivers in and around Aspen. From the Roaring Fork River to the Colorado River, enjoy the beauty and challenge of fly fishing in the Colorado Rocky Mountains with the assistance of a knowlegeable guide. Learn about river ecology while enjoying a tasty curry chicken sandwich, expertly prepared by a guide equally enthusiastic about fly fishing as cooking and serving delicious food. For an unforgettable day on the river, book a trip through Aspen Guide Service. Call 970-948-7675 to book a trip today. The Aspen Recreation Center (also known as the ARC) offers a state of the art fitness center, rock wall, indoor and outdoor ice rinks, swimming pool, and aerobic studio. The pool is a favorite for families with a two story water slide, lazy river, diving board, and lap pool. Great after a day of skiing or on one of the few rainy days in Aspen. In the spring, summer, and fall, one of the most exciting Aspen Snowmass outdoor activities is road biking on winding, mountain roads. Aspen road bike rides take cyclists to scenic areas, all while delivering a physical challenge on high altitude climbs. A popular Aspen bike ride is riding on Maroon Creek Road to the Maroon Bells. This bike ride is approximately 8 miles one way, and ends at Maroon Lake. From there, cyclists can gaze out at the stunning Maroon Bells―two 14,000' peaks. One valley over is Castle Creek Road, another popular stretch of pavement for cyclists. Ride on Castle Creek Road, and stop for lunch at Pine Creek Cookhouse. After a delicious mountain-style meal, tour Ashcroft, a former ghost town turned historical site. The East of Aspen Trail runs parallel with Highway 82 and the Roaring Fork River just outside of downtown Aspen. Follow the trail to North Star Nature Preserve, and take a break; you might just spot wildlife! If you're looking for a leisurely bike ride, the East of Aspen Trail is perfect. And if you're up for a challenge, continue on Highway 82 to Independence Pass. Over approximately 19 miles, you'll climb from an elevation of 7,900' to just over 12,000' at the top of the pass. Owl Creek Trail is a fun and easy bike ride that connects Snowmass Village and Aspen. Start off your bike ride in Snowmass Village, and head into Aspen to shop at the Saturday Farmers' Market, or to attend an Aspen Music Festival concert at the Music Tent. The Rio Grande Trail stretches from Aspen all the way to Glenwood Springs, about 40 miles away. Many people enjoy taking the trail from Aspen to Woody Creek to enjoy lunch at Woody Creek Tavern. The bike ride is about 8 miles one way, and along the way, you'll ride parallel to the beautiful Roaring Fork River. Are you ready for a mountain getaway, where you can hop on your bike, and just ride? If so, start your travel planning by viewing our luxury Snowmass vacation rentals. If you're ready to book a vacation rental, or if you need assistance finding the right rental for you and your group, contact us. Call Alpine Property at 1-866-209-1540, or send us an email. Founded in 1998, the Aspen Saturday Marketing (also known as the Aspen Farmers Market) is in downtown Aspen every Saturday from June to October. Join locals for a Saturday tradition of strolling through the market and stopping along the way to shop. Stands at the market sell Colorado-grown organic fruits and veggies, artwork, wine, cheese, honey, preserves, flowers, baked goods, jewelry, clothing, gifts, home decor, and more. The Aspen Saturday Marketing is family friendly with live music and a food court. - Open from 8:30AM-3PM on Saturdays from June until October. - Located in downtown Aspen. It starts on the corner of Galena & Hopkins and makes a U shape which includes Hunter and then goes back to the intersection of Hyman & Galena. Aspen Shakti Shala is where Aspen locals and visitors go to do yoga and meditate. Located in downtown Aspen, Shakti Shala offers classes for all levels. They’re known for their unique class offerings, including “Thug Yoga”, outdoor classes at the top of Aspen Mountain, and yoga sessions with live DJs. When you and the family hit the slopes in Aspen Snowmass, you want to have an memorable experience. Taking a ski or snowboard lesson from one of the highly skilled Pros at the Aspen Snowmass Ski & Snowboard School is a sure way towards that extraordinary experience. During a lesson, Pros work closely with you, giving you personalized tips, so that you build confidence and gain new skills. The Aspen Snowmass Ski & Snowboard School offers lessons for skiers and riders from age 2 and up. Choose a private lesson, an adult group lesson, or a kids and teens group lesson. A private ski or snowboard lesson is the best way to have fun on the hill, while also becoming a better skier or rider. When you sign up for a private lesson, you decide how you want your day to go. Want to ski with the entire family, while your Pro supplies each member with personalized tips? With a private ski or snowboard lesson, you have that choice. A surefire way to boost confidence is to take an adult group lesson with an Aspen Snowmass Pro. Adult group lessons for skiers and riders are offered at all levels, so whether you are getting on skis for the first time or the thousandth time, you can rest assured that you will be in a group that meets your skill level and needs. The Aspen Snowmass Ski & Snowboard School provides skiers and riders as young as 2 and as old as 17 with the opportunity to explore the fun and varied terrain available in Aspen Snowmass. Like adult group lessons, your child is placed in a group where they are comfortable, yet challenged, while still having a blast in the mountains. For your next visit to Aspen Snowmass, make a plan to become a better skier or rider by signing up for a lesson. Have questions about the Aspen Snowmass Ski & Snowboard School? We can answer them. Contact Alpine Property by phone at 1-866-209-1540. Aspen Whitewater Rafting offers Aspen, Colorado rafting trips on the Roaring Fork and Arkansas Rivers. Plan a family rafting trip on the Middle or Cemetery stretches of the Roaring Fork River, or try your hand at more advanced rafting in Slaughter House Fall on the Roaring Fork or Pine Creek and the Numbers on Arkansas River. See more of Aspen Snowmass this summer. Gain elevation on rugged roads in a 4-wheel drive jeep, and easily reach sites known for beautiful views of the Colorado Rockies. Why take a jeep tour? Do you need to give your legs a rest after hitting the trails hard on foot or by bike? Or, do you prefer to sit back and enjoy the views, while someone else takes the wheel? A jeep tour is an easy and fun way for you to explore Aspen Snowmass. You can reach points of interest quickly and effortlessly compared to hiking, biking, or horseback riding. Local tour guides offer full and half day jeep tours. You can sign up for a group tour, and enjoy the company of other visitors, or you can arrange a private tour for you, your family, and friends. Book a trip with a local tour guide. Alpine Property can help. If you’re staying in one of our Aspen Snowmass vacation rentals, please call 1-866-209-1540 for trip planning assistance. Plan an evening at the Belly Up Aspen to see a world famous band such as Jane's Addiction, Widespread Panic, and Lyle Lovett. Belly Up Aspen also features local bands, Monday Night Football, and special events. Be sure not to miss this intimate venue with great sound, good food, and legendary performances during your next Aspen Snowmass vacation. Snowmass Mountain is home to the Breathtaker Alpine Coaster. Hop on the alpine coaster and ride on over a mile of elevated track through an evergreen forest at speeds up to 28 mph. The Breathtaker Alpine Coaster is another fun way to experience Snowmass Mountain in the winter and summer. The Breathtaker Alpine Coaster is located at Elk Camp. To get to there, take the Elk Camp Gondola after purchasing your activity pass at the Snowmass Base Village ticket office. Camp Aspen Snowmass is a kids' summer camp that offers a wide range of outdoor activities. As Camp Aspen Snowmass is located in the Colorado Rocky Mountains, the summer camp is able to offer a number of unique activities, including nature walks, mountain biking, mountainboarding, rafting, fishing, and camping. In addition, kids attending Camp Aspen Snowmass can build rockets, play tennis, enjoy arts and crafts time, and play a game of paintball. Camp Aspen Snowmass is available to children between the ages of 3 to kids in their teenage years. If your child is looking for the summer camp experience while on vacation in Aspen and Snowmass, then look no further than Camp Aspen Snowmass. Starting in mid-September, the Roaring Fork Valley's landscape dramatically transforms from mountainsides covered in a lush green to strikingly bright yellows, oranges, and reds. Having the opportunity to view the fall colors in Aspen and Snowmass is a special experience. One of the best ways to go on a leaf peeping adventure is to select a local trail, and enjoy a hike through the glowing aspen groves. Fall hikes in Aspen and Snowmass are particularly magical, as the fall season comes with sunny weather and yellow, crunchy aspen leaves blanketing the trails. A favorite fall hike in Snowmass is the Ditch Trail, which is located just beyond the Snowmass Village Mall. Farther up valley, the fall scenery is also spectacular. Near Aspen, Castle Creek Road, located just off of the roundabout, offers the perfect opportunity for a scenic Sunday afternoon drive. The drive up Castle Creek Road is stunning in the fall, and is the ideal leaf peeping trip for visitors who prefer sight-seeing via car. In addition to leaf peeping, plan your drive up Castle Creek Road so that you can enjoy a delightful lunch at Pine Creek Cookhouse. Are you planning to visit Aspen and Snowmass in the fall? If you can't wait to view the striking fall foliage, start planning your trip today, and book Snowmass lodging with Alpine Property. 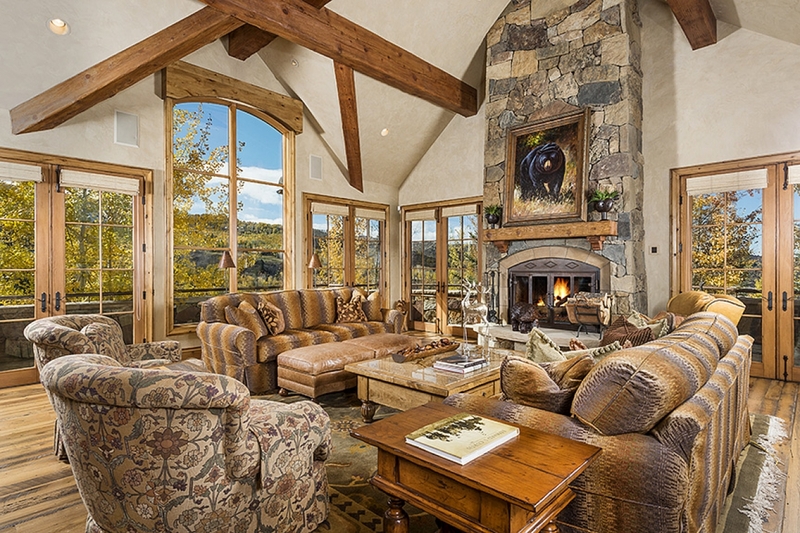 We offer a wide selection of lovely and luxurious Snowmass vacation rentals, including the following. Alpine Property is dedicated to delivering the best in luxury vacation rentals. You can rely on us to help you find the perfect Snowmass vacation rental for you and your family. Book your lodging with Alpine Property today by calling 1-866-209-1540, and get ready to do some leaf peeping! Go fly fishing in Aspen Snowmass! Fly fishing is a popular, year-round sport in Colorado, though most anglers get on the rivers in the summer and fall. In the Roaring Fork Valley, you can fish the Roaring Fork River, Frying Pan River, and Colorado River. Two local fly fishing guide companies, Aspen Guide Service and Taylor Creek Fly Shop, provide professionally guided fly fishing trips in Aspen Snowmass and beyond. Both fly fishing companies offer half-day and full-day wade trips and float trips. Your guide for the day will pick the best place to wade or float on the Frying Pan River outside of Basalt; Roaring Fork River in the Roaring Fork Valley; and Colorado River in Glenwood Springs. Guide companies also have permits for private waters. Contact Aspen Guide Service or Taylor Creek to book a trip. A great way to experience the Colorado Rocky Mountains, horseback riding is a fun activity for the entire family. Go on a guided horseback riding trip in Aspen and Snowmass through lush aspen groves, evergreen forests, and colorful alpine meadows. Located along Maroon Creek Road, Maroon Bells Guide and Outfitters located at T-Lazy-7 Ranch offers guided horseback trips for riders of all levels. Because of their excellent location, many of the company's trips take place near the stunning Maroon Bells, two 14,000' peaks set before an alpine lake. Families and groups can enjoy a short one hour trip on a nearby trail, a half day trip along Maroon Creek, a full day ride in the Maroon Bells area, evening rides with a rustic dinner, or overnight trips to Crested Butte via East Maroon Pass. Based in Snowmass Village, Snowmass Creek Outfitters offers guided horseback rides in and around Snowmass. They offer an exciting two hour ride in Snowmass Village during which riders pass through areas with stunning mountain views. The outfitter also leads guided rides on private ranches in Old Snowmass. An evening horseback ride followed by a rustic dinner in Old Snowmass supplies a great backdrop for enjoying a summer evening in the Rocky Mountains with family and friends. During the evening dinner rides hosted by Snowmass Creek Outfitters, guests listen to country music, eat a barbecue dinner, roast marshmallows on a campfire for making s'mores, and enjoy spending time together on a private mountain ranch. Fans of John Denver will love taking a stroll through the John Denver Sanctuary. Located just south of Aspen’s core in Rio Grande Park, the John Denver Sanctuary is a serene spot right on the river with boulders engraved with lyrics to popular John Denver songs. Check out the view of Aspen Mountain, and bring a picnic lunch on one of the park benches. The John Denver Sanctuary is a great place to spend an afternoon in Aspen. King Yoga is a yoga studio located at the Aspen Business Center (ABC) in Aspen, Colorado. Founded by Aaron King, King Yoga features a unique slate of daily yoga classes, such as King Yoga Flow, Yoga Sculpt, Moving Meditation, and more. King Yoga creates a fun environment in which to practice yoga with the fusion of mindful yoga practice and a playlist of inspiring music. Established in 1974, Krabloonik Restaurant & Dog Sledding has welcomed guests for over 40 years with exquisitely prepared game and fresh fish, an award-winning wine list and spectacular mountain views. All this is savored in our romantic gas-lit log cabin, while below, Krabloonik sled-dog teams leap and howl in wild anticipation of the run. Playing beach volleyball in Aspen over a long Labor Day weekend sounds like our brand of fun. What better way is there to celebrate the end of summer than by soaking up the sunshine in Aspen, and enjoying your favorite sport with fellow fanatics? The Motherlode Volleyball Classic is an annual Aspen event that draws volleyball players and fans from all over the US and Canada. Professional athletes and amateur players join the open tourney, which features over 15 divisions of play. The Motherlode tournament is accessible to volleyball players of all skill levels, which makes it a great event to learn from the sport’s top athletes. And with the Motherlode attracting pro talent, the tournament is also the perfect opportunity for top amateur players to move up to the pro level. The divisions of play are Men’s Seniors 45s, 50s, 55s, and 60s. There is also a Women’s Seniors bracket for 45s and over. The tournament has a Women’s Masters 35s and over and a Men’s Masters 37s and over. Then, there’s the Men’s and Women’s A, BB, and B divisions, plus the Standard and Reverse Co-ed A, BB, and B divisions. There’s also a Men’s and Women’s Open. On top of all of the playing and watching, the Motherlode hosts two parties at local restaurants for players―a welcoming party and a players’ party―offering players more opportunities to mix, mingle, and be merry. From expert trails with technical descents to beginner trails running through flat, open meadows, Snowmass Mountain has mountain biking terrain and trails suitable for any level of mountain biker. In addition to a wide selection of mountain biking trails, Snowmass Mountain holds private biking lessons, group mountain biking clinics, and offers bike rentals at local bike shops. During the summertime, everyone's favorite ski runs turn into beginner, intermediate, and expert mountain biking trails on Snowmass Mountain. For beginner mountain bikers, taking the Elk Camp Gondola to the top, and then riding down on the Easy Rider trail, which is designated as a beginner trail, makes for an enjoyable experience. For intermediate mountain bikers, a couple of fun trails on Snowmass Mountain include The Powerline Trail, which intersects with the Tom Blake Trail, and leads back to the base of the mountain. Expert mountain bikers can skip the lifts by taking the Tom Blake Trail up the Anaerobic Nightmare, hopping onto the Government Trail, and riding down to the base of Snowmass via the Valhalla trail. Mountain bike rentals are available at Four Mountain Sports in the Snowmass Village Mall and in the Snowmass Base Village near the Elk Camp Gondola. However, mountain bikes are also available for rent at any of the other Four Mountain Sports locations in Aspen and at Aspen Highlands. Four Mountain Sports rents out downhill and cross country mountain bikes for adults and children. Mountain bikers can also register for downhill and freeride mountain biking clinics in Snowmass to learn the art of maneuvering on a mountain bike over rocks and along tight switchbacks. Mountain bikers ages 16 and older are welcome to sign up for these daily group mountain bike clinics held throughout the summer season. Mountain bikers must register for group lessons. For the younger set, Camp Aspen Snowmass offers kids' mountain biking lessons for kids ages 8 – 15. Kids will learn the essential skills of downhill riding from a trained and professional mountain biking guide, and explore Snowmass Mountain biking trails suitable for their skill level. O2 Aspen is a yoga studio located on Main Street in Aspen, CO. With a variety of yoga classes ranging from power yoga to yin yoga, O2 is a great place to restore and re-energize. O2 Aspen also offers Reformer Pilates Equipment and Pilates Mat. Visit the O2 spa for facials, massage, waxing, lash extensions, and brow tint. Though a landlocked state, water sports are still a popular outdoor activity in Colorado, especially whitewater rafting. In Aspen and Snowmass, there are a handful of rafting companies that offer guided rafting trips on the Roaring Fork River, Colorado River, and Arkansas River. Find out which guided raft trip is best for you and your group. The Pine Creek/Numbers sections on the Arkansas River offers the chance for expert paddlers to tackle Class IV and V rapids. For a great family-friendly rafting trip, the Class II and III whitewater rapids on the Colorado River, called the Shoshone run, offers lots of fun. Floating on a raft through Glenwood Canyon right outside of Glenwood Springs lets you soak up some sunshine, take in the amazing views of the Canyon walls, and enjoy stretches of exhilarating rapids followed by intermittent sections of quiet, calm waters. Getting outfitted with the appropriate rafting gear will make for an enjoyable time on the river. It's never fun to lose a favorite pair of sunglasses, so make sure they stay in place with a sunglasses strap. The same goes for footwear. If rafting in the summer, wear sandals that can be securely strapped to the feet, especially around the heel. During colder weather rafting trips, rafting guides provide neoprene booties. As for clothing, it's best to wear layers of quick dry clothing. For summer rafting, wear a bathing suit underneath a layer or two of quick dry clothing. For cold weather rafting trips, the most comfortable clothing to wear is a wetsuit and a splash jacket, both of which are provided by rafting companies. Top everything off with a hat and sunscreen, and you're ready to hit the river. Interested in booking an Aspen rafting trip? Contact the Alpine Property concierge team by calling 1-866-209-1540. Relax and rejuvenate at the Remède Spa at the St. Regis Resort Aspen. Remède Spa offers massage, facials, body treatments, and salon services. After your treatments, relax in the oxygen lounge or in the vapor caves. In addition to hiking, biking, and skiing, while visiting Aspen and Snowmass, treat yourself to a day at the spa to relax and release tension. River Valley Ranch is a golf and tennis community in Carbondale, Colorado. With a critically-acclaimed golf course, an excellent tennis program, a fitness center, and more, River Valley Ranch is a family-friendly community known for its active outdoor lifestyle. Open to the public, the River Valley Ranch Golf Club is a beautiful Colorado Rocky Mountain golf course with challenging terrain and spectacular views of Mt. Sopris. Visit River Valley Ranch and the River Valley Ranch Golf Club in Carbondale today to learn more about this idyllic mountain community. When you aren’t tearing up the slopes, gather the family together for bowling at Slopeside Lanes, a bowling alley in Snowmass Village. Enjoy some quality time, and also a welcome change of pace from hiking, biking, or skiing. And when you’re worn out from throwing strike after strike, put in an order of classic bar snacks, like mozzarella sticks and chicken wings. Your group can also enjoy a casual meal of burgers, sandwiches, and wood-fired pizzas. For adults, there’s a wide selection of beer and wine. Experience a piece of Aspen’s past on a tour of Smuggler Mine. During these tours, you travel deep into the mine as guides share fascinating stories about life as a silver miner in the late 1800s. Book a Smuggler Mine tour, and get to know another side of Aspen. Visit the Snowmass Recreation Center, a 16,000 sq. ft. rec center with a fitness area, gym, climbing wall, salt water pools, skate park, tennis courts, volleyball courts, and more. Perfect for the whole family in winter and summer. Fitness classes are offered including Zumba, Mixed Martial Arts, Pilates, Tai Chi, Power Cycling, Yoga, and more. A unique way to explore the backcountry during the winter, snowmobiling in Aspen Snowmass is fun for the whole family. Local guide companies offer snowmobile tours to scenic locations, including the Maroon Bells. T Lazy 7 offers daily snowmobile trips to the Maroon Bells in the morning and afternoon. During the winter, the Maroon Bells Recreation Area attracts few visitors, which means you’ll have little to distract you from the incredible views of Maroon Lake and the two snow covered 14,000' Maroon Bells. Western Adventures in Woody Creek offers snowmobile trips near Lenado and Larkspur Mountain. They offer shorter 2-hour trips and half-day trips. Snowmobile tours in the backcountry in and around Aspen Snowmass is a unique way to experience the Colorado Rockies. Take a day off from the slopes to spend the day with the family zipping around on a snowmobile. The Aspen Institute is a key player in the development of a thinking society. In the Aspen community, they provide a space for intriguing, open discussions on important topics that have an integral role in our daily lives and in the lives of future generations. Throughout the year, the Aspen Institute holds numerous events to engage people from all walks of life in a great conversation that can aid in creating a better world. The Aspen Institute hosts the Aspen Ideas Festival each summer which brings together leaders and interesting thinkers from around the world to discuss their work, ideas, and the issues that inspire them. Past speakers include Thomas Friedman and Cory Booker. Your Aspen Snowmass vacation isn’t complete unless you visit the Maroon Bells. The Maroon Bells are two 14,000 foot peaks located about 8 miles outside of downtown Aspen, CO. And, they’re the most photographed mountains in North America! Maroon Bells Bus ― Take the Maroon Bells Bus Tour with the Roaring Fork Transportation Authority (RFTA). During the drive to Maroon Lake, the bus driver points out marmots sunning themselves on rocks, avalanche chutes, and other interesting sights. Guided Bike Trip ― Another way to experience the Maroon Bells area is by guided bike trip. You get to tour the Maroon Bells, and then coast (literally) all the way back into Aspen. Snowmobile Tour ― Visit the Maroon Bells in winter by taking a snowmobile tour. With the road closed to vehicular traffic in the winter, snowmobiling is the quickest way to get to Maroon Lake! 1. Walk around Maroon Lake. 2. Learn more about the area on a hike to Crater Lake with a naturalist guide from the Aspen Center for Environmental Studies (ACES). Buttermilk Mountain in Aspen, Colorado is the main stage of the Winter X Games. The mountain has hosted the action sports competition for over a decade now. Held in late January, X Games Aspen attracts huge crowds to Aspen Snowmass. And in the past few years, the annual event has grown to include a festival village and musical performances. Past artists include Snoop Dogg, Wiz Khalifa, Skrillex, Chromeo, Tiësto, Phoenix, Axwell, and Matt & Kim. X Games Aspen offers free admission to all of its sporting events. And that means, anyone can watch 200+ talented athletes compete at their highest caliber, day and night. X Games Aspen has welcomed the athletes listed below to compete for medals and purses. The Winter X Games Aspen is a popular event, and often leads to sold-out accommodations. The sooner you reserve an Aspen or Snowmass vacation rental, the better. Have questions about the right Aspen Snowmass vacation rental for you? Give us a call ― 1-866-209-1540, or send us an email. We'd be delighted to review our rental inventory with you.